Nature's Peace and Hope | A place where you can feel accepted and loved and learn to spread peace and hope out into the world where it will return to you ten fold, lighting your own Soul Beacon of Life. As the holiday week began in earnest last night (for both Christmas and Hannukah), I send extra love to my friends with chronic illness. As one friend recently reminded me, constantly fighting this sh*t is HARD! Which made me think… at least 15% of society does not get any holiday time-off. Yet friends and family, and lets face it, ourselves, have pretty high expectations of our energy and ability to engage in all the same activities we used to do, pre-illness. Living with chronic illness is a FULL TIME JOB. No holidays “off,” no vacation or calling in a “me-day” on accumulated sick days, no summer vacation, no breaks for our birthdays. I certainly don’t mean to be morbid! I am just standing in solidarity with my chronically ill brothers and sisters. Because we still try to put on our Santa hats and reindeer bells and look festive on the outside while we feel awful inside. Our hearts want to receive each and every hug, but our bodies pray for not another pain-full squeeze. For me, my body tenses up. Its almost like an unnecessary fight or flight reaction. So that I many times don’t feel the overwhelming fatigue and pain until I sit down at home post and my body desperately goes into spasm. * We may need to be selective about how many events we go to in order to conserve and stretch out our energy reserves (our “spoons”). * We may skip the more crowded events in exchange for more intimate gatherings. Large groups can by over-stimulating and overwhelming and very fatiguing. * Our schedules may seem unconventional. This year for example, I did church on Christmas Eve with my family, and then we’re not exchanging presents until the 28th. My husband and I cap off the holiday week with celebrating Our Christmas on New Year’s Eve and Day. Its not like I can go out on the town to ring in the New Year anymore! * The hardest limitation I’ve had to enforce, is cutting out friend activities: Friendsgiving, White Elephant and Secret Santa, Cookie Exchanges, … In exchange for being able to participate in family celebrations. It has taken me many, many years to come to this balance. And I still struggle with missing out, and even worse, disappointing those I love. Family and friends can be so incredibly understanding and supportive. As long as I explain the place I am coming from. And the very few that don’t, aren’t worth any of your energy. Am I miffed at my illness. Hell, yeah! It’s a freakin’ 24/7 job. I can’t take my body off, like a scuba suit, and set it in the corner for even a 5 min. break! Do I feel melancholy? You bet! I miss walking through cities and malls to look at the holiday displays with Christmas music floating all around me; joining the local town Christmas strolls and tree lightings. BUT I REFUSE TO LET MY DISEASE TAKE ANY MORE OF MY LIFE! I love Christmas! So I’m not going to compare what I can or cannot do. I am going to appreaciate the beauty of every moment I AM well enough to experience. No matter how small. We have been given one special gift through illness, to recoginize hidden hope and miracles that others miss. So to my over 15% of FaceBook friends (that I know of) with daily chronic illness, you are not alone! We celebrate together!! And to our friends and family, thank you for you understanding, your patience (especially when we’re running late or cancel last minute), for your gentle hugs, and comfiest chairs. We feel grateful for every moment we get to spend with you! Five simple words that can immediately stop a supportive conversation of open-ended dialogue. I implore you to remove this statement from your vocabulary when speaking with someone who is struggling with a chronic illness. We know that, at its core, people say this to make the person feel better. And, truthfully, to make themselves feel better, because they’re at a loss of what else to say or do to support us. We know it comes from a place of love. But, unfortunately, all those five words serve is to demean what we are actually experiencing. I know this is not the first time I’ve talked about this, but it’s worth repeating. Because people forget. What often happens, is that it is one of the first things said upon greeting one another, if not the first. So it then makes it very difficult to reply honestly about how we are really feeling, inside, after the proverbial “you’re looking great!” horse leaves the barn. And then let us fill in the blank. It’s difficult to make space for truth telling. Many of us are afraid of what our loved ones are going to say. We know you don’t want to see us in pain, let alone hear that it may be unrelenting right now. Just as we want to shelter you from the reality of our daily pain, it must be equally difficult for you, as the care giver, to feel powerless over relieving your loved one’s hurts. The most interesting part is you’re not alone! Even doctors fall into the “but, you’re looking so good trap.” This topic came up recently with a friend who has M.S. and his experiences mirrored my own. He was most baffled that the medical community would so easily fall back on this platitude, too. Aren’t they here to hear our actual symptoms, concerns and problems? Yet, at my most recent appointment with my primary, he led and ended our visit with this very statement: “Well, at least, you’re looking really good!” Because, at his core he was at a loss for what else to say. But, I, as the patient, would rather have silence than an empty comment. It’s the doctors and allies who avoid this, and give space for comforting silence, that we return to again and again. Who we trust to listen to us. They, you, don’t need to fix the problem or even offer a solution. I have one doctor who at my last appointment, held my hand and said, “I am sorry this is all happening to you.” I didn’t leave the office with an “answer”, but I left feeling comforted.  To be heard, without judgement and to be validated. This may be difficult because we are asking you to challenge yourself. But I truly don’t think this applies to just “us” who are struggling with daily chronic illness. We all, as humans, just want to be accepted for who and where we are, at this moment in time. None of us knows what is “going on on the inside” of another. Each of us may be walking around looking fabulous, yet internally feeling at odds with uncomfortable feelings around our job, an intimate relationship, or even thoughts of our ill loved one. So, next time you greet a friend, especially one who has an “invisible,” chronic illness, ask an open ended question and allow them to fill in the blanks. And if you are incapable at that moment to hear the truth they may speak, that’s okay, too. Please just don’t dismiss the situation with the blanket statement,“Oh, but you look so good…” You can always say something like, “Hi, is it okay to give you a gentle hug today?” or “I know your energy is a precious commodity; are you up for a short visit today?” Skip over the external appearance all together, quietly validate the person’s true position, and move on. We don’t expect you to make things better. We just want you to be by our sides. This is a question that has always haunted me. And most recently it has resurfaced. 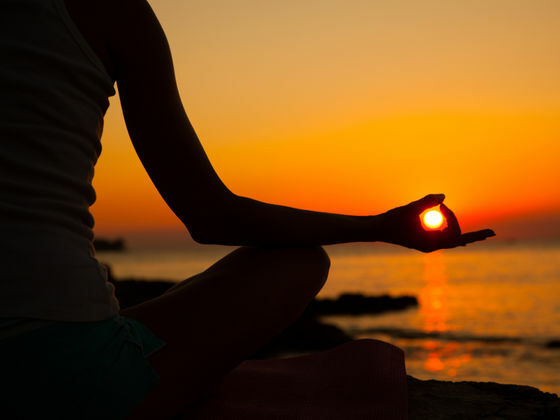 If we have the power to heal ourselves than the inverse must also be true… we have the power to make our bodies unwell. Right? A week back, a dear friend was doing some energy work (Reiki) on me. During this session, she received messages from my body. This is not uncommon, and I generally find these messages very helpful. I’ll admit at first this was empowering. All I had to do was write and then share, without fear, my experiences. A clear path to wellness was laid out for me! And I did start writing. It was, and is, a freeing experience. But I also started to think about the root of the message: by keeping these “secrets” (which for me surround years of sexual abuse at young ages; a fact my friend was not aware of, making the message all the more powerful), I had made myself sick. That’s what it came down to. And I started to feel uncomfortable about this. “Desire, what do I desire? And they became incensed, on my behalf. Telling me not to take on someone else’s dogma as my own. That that would mean that all Jews murdered in concentration camps fore-chose that path, as well as other startling examples. So I took both opposing views and sat, to develop my own. Yes, I believe we all have the capabilities to make better choices for our spirits and bodies, to live from a mindset of wellness that leads to true physical wellness. But there is also a huge component of our diseases that are out of our control. And if we get stuck in thinking, “Why am I not doing enough or the right thing to make myself well?” Along with, “What did I do wrong in my past to make myself ill?” It will only lead to a place of despair. I have received many messages that I have the power to make myself well. But I do not believe that means I am meant to “fix myself” on my own! I also take time at least once a day to visualize a little army of worker elves marching through my body and fighting off my disease; sending it into Mother Earth to be cleansed, recycled and renewed into something beautiful and useful. These are tools I think are helpful for any person…well- or dis-abled. And, yes, I will continue to write my story. Just by being away from the blogging community, I have gotten “clogged up.” There is power in speaking one’s own truth, sharing it with others, and hearing their truth spoken back. This can only aid in the progress of my healing. But can this, or myself, alone, “make myself well?” That’s a tall order! And all it makes me think is that I somehow made myself sick. And that’s a very isolating thought. I, alone, can’t fight any of this. That goes against My Dogma: It takes a village…. 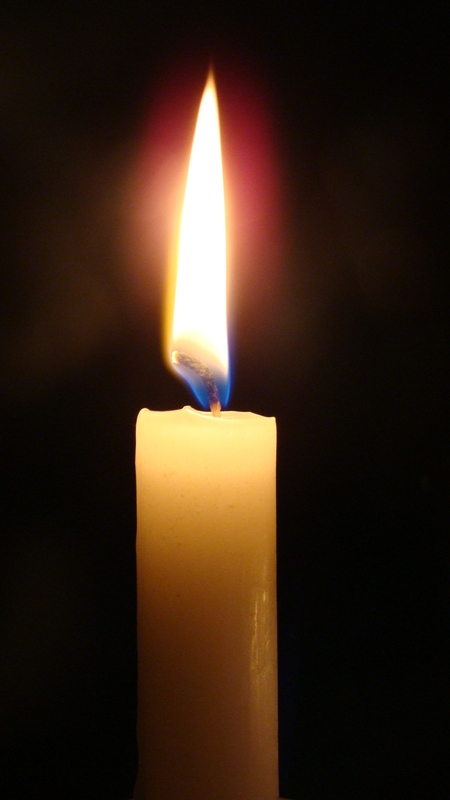 To keep the flame alive and pass it on. I don’t know why I live a life filled with unpronounceable, rare illnesses. But that’s not my job to know or figure out either. The only difference between me and that precious 4 year old girl is that I know I am sick where she does not (quite yet). Her attitude can teach me, and us all, a great lesson. She just lives each day as it comes. Feeling her feelings when they arrive, asking questions with out shame, playing when she feels like playing, resting when her body tells her it’s tired; and loving everything and everyone around her deeply, with natural childhood enthusiasm. Her disease is a part of her day, but it is not who she is. She did not make herself sick, and the key to “making herself well” is already inside her: its by going forth one step at a time and not missing a beat when she has a chance to fully embrace and engage in the gifts of life that are in front of her! It’s as simple as that. Not secrets, not truth telling, Just Living. As I have said before, it is the “unknown” that is always more difficult than the knowing. The waiting. The wondering. The wandering… of the mind as it tries to grasp on to something concrete. My last several months have been spent in this suspended state. First we found out that our home of 15 years was suddenly being sold and we had to, in weeks time, find a (hard sought after one story) home, apply for a mortgage (which had become a Big Scary Monster in our heads), sort and pack through years of our life and family “heirlooms,” find the means to buy (and fix up) said house, move and settle, the list goes on. And you know what? One (baby!) step at a time, we walked our way right through the scary terrain of the unknown and into our brand new home. These are the lessons and skills I so desperately need to remember to apply to my life now. Because just when I thought I was leaving the path zig zagging through The Woods of Uncertainty, I fell into a Bog of Burdensome Worries! (Didn’t mean to go all Tolkien on you!). I’ve known since fall that my body was heading into unknown territory again. It’s both a blessing and a curse that I am so in tune with my physical being after years of severe illness and trauma, that I can tell as soon as I start to go off-kilter. This time, I knew somehing major was brewing. That wasn’t too much to ask, was it? Guess it was! So my body went from flashing yellow to a blaring red : STOP!!!!! A little over a month ago, I was reading when half the page disappeared. No joke. I could only see half of every word. A very strange and scary experience. So I shook Dave awake with a, “Honey, I need to go to the ED.” Complete resignation. No questions anymore. The details since don’t matter as much as the lessons I’ve learned. But in brief, I am in an even deeper state of limbo… not quite knowing the true cause of my weakness and Optic Neuritis (the partial blindness ) yet (MS? CIDP?) and therefore not able to receive the right treatment aside from high dose IV steroids to abate my symptoms. So nothing left to do but Surrender. Wave the white flag of blind faith (literally this time!). And to reach out for help. I already feel physically vulnerable, so why is it still so hard to completely crack open and be emotionally vulnerable, too? And my friends and family showed up. They packed, they listened, they moved, they cleaned and scrubbed my new abode. All with a smile and an encouraging hug. No expectation of return payment. This move would not have been possible without this team! So why should my health be any different?! I need to throw out the old skipping records that get stuck on the refrains filled with shame. Shame over my diseases, over my needs and inability to “do it all” for myself; shame over what I used to be like vs what I am like now; shame over always needing more. But, most of all: FEAR. Fear that I won’t be able to give back. But we all have our own gifts to offer to the world. And for a long while, mine were coming in the form of my words; of being completely vulnerable through my stories. Through sharing with others and having them, in turn, share with me. But as soon as life became overly tangled, I stopped writing. Which essentially dammed up my River of Grace… the universal energy that flows into, through and out of me… on to you… connecting all of us on this divine journey of life. So that WE ARE NOT ALONE. So I think of Buddha’s quote, “if you light a lamp for someone else, it will brighten your own path.” And it helps me remember that whenever someone “allows” me to help them, it always feels like I am the one receiving the gift! So while my path is now being illuminated by the inner light and energy from other’s (as I write a dear friend is coordinating meal help for us; fulfilled by those who know me and others who are doing so purely as a random act of kindness); I am holding out my own candle in hopes of lighting just one other’s dark path of the unknown. There is so much going on beneath the surface of each of our lives. Let’s look just a little deeper inside. I know I’m grateful someone stopped and did so for me. All while holding a candle to help light my way, as I take just one next step forward along the path. For as long as I’m moving forward, I’m heading in the right direction. Equally embarrassed and curious, I risked a glance over my shoulder to see the source. I discover that, yes, the teen in question is slender and fit. But, the mother is not. In fact, she looks like she shops for size 16, the same as me. As found in most plus-size sections. As much as I felt like hiding my face behind a rack for fear of being seen shopping in the “Fat People’s section,” I found myself even more concerned with those shopping around me. Because I happened to be browsing in the juniors section, filled with impressionable teens. The store was packed with large groups of young women shopping for semi-formal dresses (Homecoming, perhaps?) and they were all shapes and sizes. Luckily, it seemed I was the only one close enough to be hit with this verbal vomit. And, honestly, my gut reaction was to say something to this woman. But no matter the pithy comment I thought of, all of them seemed as if they would only exacerbate the situation; and give weight to her words. But now I wonder. Should I have said something? So that if, by chance, any young mind had heard, they would know that not all people agree with this statement nor think that it is right. But, I admit, in that moment I fell victim to Body Shaming. I felt uncomfortable in my own skin. Worse, I didn’t feel like I had the “right” to say anything to that woman because “technically” I am a “fat person.” It seemed like it would be better coming from someone with a slimmer silhouette. In less than 30 seconds, I felt less than. But, perhaps, I could have calmly said, “I understand this section isn’t right for your daughter. But it is right for lots of young woman and your words were hurtful and inappropriate.” What do you think? I started to observe the groups shopping. I noticed that groups of peers were generally supportive of each other. Each group contained a wide range of body types but instead of comparing or belittling, they lifted one another up. They suggested flattering outfits, complimented each other, and when in the changing room, if something didn’t fit or look right, they giggled about it instead of making disparaging remarks. Conversely, I witnessed a different type of reaction between mothers and daughters. Moms were quick to point out things that wouldn’t look good when their daughter excitedly held up an item. Most often with a “Really? !” and a raised eyebrow. One word that can speak (negative) volumes. And the parents who had slim children seemed to flaunt them; many of these parents being less-than-fit themselves. As if their child’s attractiveness was a direct (positive) reflection on themselves. Yes, I know it was clothes shopping, which directly lends itself to “body talk.” But why can’t it be positive, supportive body talk? Soon after this, I found myself in the dressing room. As I faced the daunting task of trying on a pile of clothes, knowing that if I found 1 thing that fit well, it would be a success, I was presented with two options. One, to let that woman’s voice seep in and take up court with my mental judges, or, two, to dismiss her as an ill-informed person. I actually felt some compassion for her. How? You may wonder. I realized she must feel so uncomfortable in her own skin, she needs to belittle others and take on her daughter’s identity in order to feel better. What a painful way to walk around. I looked myself straight in the mirror and reminded Me that we each have our own story. My weight is from years of physical conditions, surgeries and side-effect laden meds. I used to “pre-emptively” want to explain that to people (strangers, that is!). Even going so far as hoping they would think I was pregnant instead of “abdominally challenged.” Now, I remind myself we are all walking around with our own stories, no matter the exterior appearance. Being overweight comes from a variety of sources, whether it is physical or emotional. I also looked myself square in the eye and made myself stand tall and proud. I committed to trying on clothes with a critical eye; not one of a critic putting myself down but critically, assessing which things compliment me and which aren’t suited to my body type. Period. And a funny thing happened… I ended up finding too many items that fit me well! Wherein I needed to pick and choose and leave half in the store for another time. That rarely happens! I also walked through the store proudly. I didn’t let one person’s shaming shrink me. Depending on the brand, I can wear anywhere from a Lrg to a 2x. That’s a wide range! It also means I shop almost every section of the store. I committed to acting the same way no matter the area; to not feel like a fraud when I’m in the “regular sections” and to not slouch and hide in Women’s or Plus. I am who I am. And I belong here too. As a society, we need to stop “Body Shaming!” That includes making negative, derogatory comments about people or celebrities wearing (what we think is) an unflattering outfit. We need to refrain from making comments about what others choose to eat. We need to cease the “non-verbal commentary” of a pointed look, raised eyebrow, smirk, or the good ol’ eye-roll. Or even the sound effect comments: “Hmmm…,” “Eww,” “Ugh,” *sigh*, etc. We all know what I am talking about. Body shaming isn’t right. Worse, it isn’t supportive. As women, we should constantly be lifting each other up not tearing away at each other so we feel better about our own selves. And this includes people who you do not know… It is ALL wrong. All that mother needed to say was, “Oh, hon, this section doesn’t have your size. Let’s check over there.” Instead, within her original comment, she not only put down anyone shopping in that section, she also put down herself, and her daughter. Because I was once a slender and fit girl, too. I no longer fit that body type. No one knows where our lives will lead. And we all deserve the unconditional support of our mothers, sisters, and Sisterhood at large. How can you support a fellow woman today and Stop Body Shaming? Why do I still feel embarrassed to express to my “well-bodied” friends that I am less-than-able on many days? Partly, I struggle to find the right words; the delicate balance between clear explanation and what I fear may sound like whiney complaining. And then there is the bigger problem: the fact that I look so well. Especially on the days that my friends do see me. Because it is the days that I feel well enough to wash my hair (perhaps! ), put on some makeup, get out of my lounge clothes, smile, and be present, that I also am able to keep my plans with them. They’re not seeing me on the days when my arms feel like 20lb. weights, too heavy to lift and brush the bed-tangles out of my hair. Or when I am still wearing what I woke up in, which many times even means what I went to bed in, because I was too exhausted to do anything but take off my bra the night before! And truth be told, the sound and timber and strength of my voice doesn’t often change that much when my physical body is feeling poorly. And for me, my larynx can be in spasm causing hoarseness when I do feel well. So since that’s such a poor barometer for “feeling well vs. feeling poorly,” why is it then that people seem to think that what they hear over the phone lines is some sort of truth serum? Unfortunately, they are often spoken before I’ve even had a chance to say how I am truly doing. So, I hesitate. Because it gets tiring saying, “um, thanks. But, actually, I’m not doing so hot today.” And even with my most well-intentioned friends and loved ones, I sometimes hear skepticism creep into their response. Because it just doesn’t make sense: but they sound so good…? A quick reminder: Invisible Illnesses encompass a wide range of conditions and diseases. Take the common condition of arthritis, even. Yes, a joint could be swollen or red, but many times it can ache with no outward physical manifestation. So now think of all the conditions that effect our “internal systems,” from brain chemistry, to GI disorders, blood, vein and heart conditions, nervous system pain and disruption, connective tissue deterioration… the list goes on and on. These are the “Invisible Illnesses” that hide behind an external mirage of wellness. Wouldn’t it be handy if when something was ailing or failing on the inside, a bright red “warning spot” would emerge on an external location?! I sure would find this handy! Not only for letting others visibly know something painful is going on, but also to help pin-point for both myself and my doctors, what system is causing the pain. Since this warning system technology is yet to be invented, we have to trust what people say. To take them at their word. You don’t have to completely understand what someone is describing to give them love, support and empathy. And unconditional trust in their word. Sometimes I worry (too much so) that the person I am sharing my ills of the day with will think I am only saying it to get out of seeing them. At least for me, this is never the case! In fact, I am one to mask my true feelings of pain and discomfort just to avoid hurting or disappointing another. I know I am not alone in this. So what can we all do as a collective group who cares for one another, to combat this? Don’t Assume: Don’t assume just because we sound okay, or even because we look okay, that we feel okay. Don’t assume that because we were able to yesterday, we will be able to today. Or even, if we were able 15 minutes ago, that our bodies’ are still feeling as abled in This minute. Listen: Please ask us how we are really doing. And then give us the space to truthfully answer. Take our answers at face value; please don’t judge or question (or fill in the blank!). Give us space without expectations. We know (believe me!) how hard it is to accept that there is no clear pattern to our symptoms. We may feel better in 1 day, 3 days, maybe even 30 minutes and that can be frustrating. So we just ask for your patience as we navigate the unknown. Don’t stop asking. This is a big one! And I don’t mean “don’t stop asking how we are doing” (although that’s a good thing, too); I mean don’t stop asking us to do things. Because there still are many days when we are able. And spending time with you, helping you out and supporting you, still means a lot to us. This is what feeds our soul and keeps us striving to be and get well. It’s Okay. You’re okay. You are whole and complete exactly as you are. That was hard for me to write, because I am not just saying it to you, I am saying it to myself. 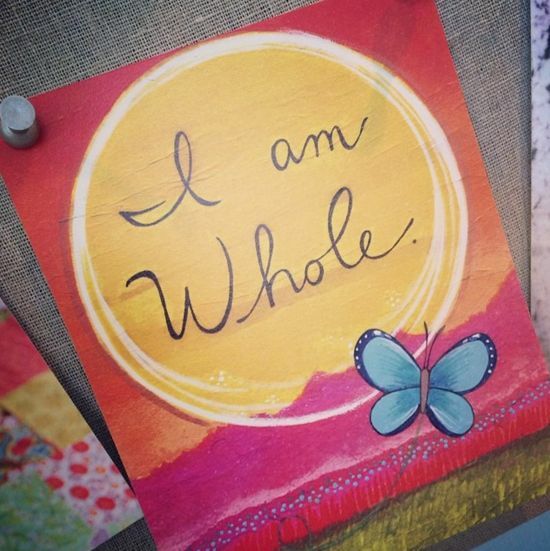 “I am whole exactly as I am.” You/I/WE do not have to be anything other than what we are capable of being. We did not create these illnesses nor are we using them as a crutch to “get out of things.” They inhibit what we can do on a daily business, but they are not the all of us. We are not defined by our illness. Our friends like and love us for who we are: the pure essence of us, our true spirit. Not for our physical abilities or dis-abilities. And if that is how someone defines “compatibility” in a relationship, they are not the kind of supportive friend you need, or deserve. Be patient. You may need to explain your daily needs and limitations over and over again. This can feel frustrating or maybe even like the other person is questioning your authenticity. In most cases, this isn’t true. Remember: it’s a foreign language, and people don’t learn to comprehend a foreign tongue overnight! Most times, our loved ones keep asking questions, only because they want to understand. If someone asks how they can help, and you can think of a way, ASK IT. Don’t be stoic. Don’t hope that they’ll just guess at what you need. (How could they?!). And don’t ever feel embarrassed. This last one happens to me. Because I start to think “But, I should be able to do this.” Trust that if someone offers to help, their offer is sincere and that if what you ask for is too much for them, they will let you know. Think how helpful it would be to have someone cook you a meal, or run an errand/do a household chore, or even help you to color your hair. Remember that friendship is based on unconditional love. Our friends and lovers chose us for the person we bring out in them, just as we love them for the person they bring out in ourselves. We are all here to be our best selves, but that does not mean trying to be something other than you are. Or can be, physically. There is more to you, there is more to me, than our physicality. It is up to all of us to spread the word on Invisible Illnesses. To take the stigma and mis-understanding out of them. Because millions and millions of us walk around looking “just like everyone else,” while on the inside of bodies are crumbling. The first step to undoing all the misconceptions around these illnesses, is to start with a deeper understanding of each other, on a one to one basis. Which includes a deeper understanding of our own needs and abilities, followed by acceptance of same. It’s time to embrace all that we do bring to the world rather than all that we do not! Never give up on hope. I’ve heard people eschew this often overused word as unworthy of attention. A word that only gives false hope, which leads to continued feelings of rejection, loss, and disappointment. But, Hope doesn’t guarantee that life will suddenly become filled with rainbows, leprechauns and unicorns. What it does do, though, is pave the way for possibilities! Possibilities of a life lived better than the one today. Possibilities for answers to our problems; for solution-oriented thinking. Because when we have hope, we encourage others to do the same. To not give up… on us. On the situations at hand. On whatever obstacle is currently in front of us. If I had given up hope 8 years ago today because the doctors told me I had a 10% chance of making it through the night, I am 100% positive I would not have made it through that night. But the doctors, the nurses, all the caregivers saw that hope within me. Because hope burns like the brightest candle in your soul. And it fueled them to work through the night to save me. It is undeniable; a hard to ignore source of personal power. But I also think that’s what scares people most about hope. Why they begin to shy aware from it, call it out as being “cheesy” or setting oneself up with false expectations. Because they are afraid of their own burning flame… we all have the gift of this, if we stoke it, feed it, let it grow. I saw a woman (Cheryl L. Broyles) share her story of hope last week on a daytime talk show. A story wherein 15 years ago she was given 6 months to live as she battled terminal, incurable cancer. But, she said, “NO. I am not giving up hope for survival, for myself, for my life, for my family. And I refuse to let you give up hope on me either.” And here she is, 14 years later, sharing her story. She talks that what keep hope alive for her is making “deals” with herself; “when I reach my 1 year, 5 year, 12 year anniversary marks, I will do the following feat. Or, I am going to stay alive to see my children enter kindergarten, then it was high school, college, and now, have their first child.” And she now helps other people keep their hope alive. And that’s when it hit me; I’ve stalled out on spreading my hope out to the world. It was the greatest gift that came from my survival; it was my mission statement when I started this blog. It was my goal when I planned to publish my story. And I have done many of those things. And I certainly make an effort to “practice hope” in my individual actions. But there still is a lot to do; there is still a lot a want to share. And that is where I lost my hope. Because Hope doesn’t mean that life becomes easier. If anything, my life has become, and continues to become, more and more challenging. But what if that’s all part of my story? Who am I to define what hope looks like for me, or for anyone else? All I do know is that hope means to keep moving forward. To push outside the boundaries of conventional thinking. To look at things in new and different lights. Because it’s not just us with chronic or terminal illnesses, that benefit from this hope. IT IS EACH AND EVERY ONE OF US! From the smallest daily conundrums to the bigger challenges in relationships with our partners (current and ex! ), children, and co-workers. And on to our inner desires and dreams. There are always ways to achieve what we want and need; it’s just not always gained by the conventional route. And that’s where hope comes in to play! Because once you give yourself fully over to the idea of hope (of worthiness), then you can’t help but say, “Well, then, how I am going to make the seemingly impossible, possible?” Once you open the door to new possibilities, you open the door to light. 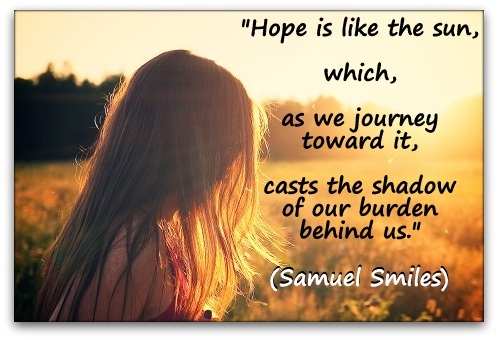 I often hear hope and faith lumped together. And this, too, can turn some people off to the idea of fully embracing “hope.” Because they equate faith with religion, and that’s not the space they find their hope in. Many people do, and that’s a gift. My faith lies both in the power of actively practicing Hope, but also in the belief that I am not the one directing what that hope looks like. I may still die tomorrow; but at least I know that I didn’t go down without a fight. That I didn’t live every moment as fully as I could, in that moment. And that I didn’t let others give up on me. Even more importantly, I didn’t give up on myself. So open your heart to a little bit of hope today. Feel that candle of life, love and energy burn within. You truly are worthy of it… all.